In Salaam, Love, Ayesha Mattu and Nura Maznavi provide a space for American Muslim men to speak openly about their romantic lives, offering frank, funny, and insightful glimpses into their hearts—and bedrooms. The twenty-two writers come from a broad spectrum of ethnic, racial, and religious perspectives-including orthodox, cultural, and secular Muslims—reflecting the strength and diversity of their faith community and of America. Nura Maznavi and Ayeshu Mattu were interviewed on Chicago Public Radio's "Afternoon Shift"
By raising their voices to share stories of love and heartbreak, loyalty and betrayal, intimacy and insecurity, these Muslim men are leading the way for all men to recognize that being open and honest about their feelings is not only okay—it's intimately connected to their lives and critical to their happiness and well-being. In their introduction, Ayesha Mattu and Nura Maznavi ask the question, “What if it’s not that men don’t want to talk about their feelings, but rather that they don’t have the space to do so?” Do you agree that men don’t have the space to be “honest and vulnerable about matters of the heart?” Were you surprised by the responses they received from American Muslim men? What was your perception of Muslim men before reading this collection? Has it changed after reading these stories? If so, how has it changed? How do the stories in this book fit into your understanding of how men view love and relationships? Which story most resonated with you, and why? In “Soda Bottles and Zebra Skins,” Sam Pierstorff describes the five essential pillars of Islam taught to him by his mother, “1) believe in Allah and his final prophet, Muhammad; 2) pray five times a day; 3) don’t look at girls; 4) don’t speak to girls; 5) don’t think about girls.” How does this humorous description of the pillars of Islam accurately capture a real tension in the lives of American Muslim men? The second section of the collection, entitled “Sirat: The Journey,” describes the romantic, personal, and spiritual transformations that occur over the course of these men’s lives. What transformation did you find especially surprising or compelling? In the final section, the contributors lift the “façade of happily ever after to share what it really takes to keep a relationship going over a lifetime.” What moments from these stories resonated with you? Do you believe the contributors accurately capture the work and sacrifice necessary to maintain a lifelong relationship? Mattu and Maznavi write, “By raising their voices, these Muslim men are leading the way for other men to recognize that being open and honest about their feelings is not only okay—it’s intimately connected to their lives and critical to their well-being.” How does the collection as a whole open the door to a larger discussion about masculinity, love, and intimacy? 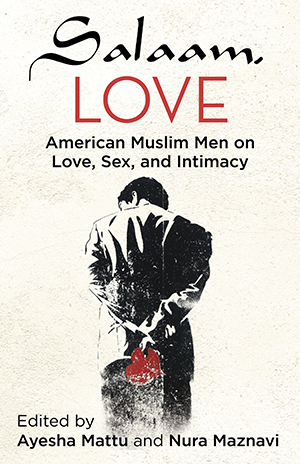 As the editors describe, these American Muslim men “welcome us—with open arms—into the most intimate aspects of their lives.” Were you ever surprised by the level of intimacy and private details shared in these stories? How did this affect you? In “Finding Mercy,” Anthony Springer Jr. writes that, “Having a safe space to share my story was liberating. I’d realized that ‘Anthony, the Muslim’ and ‘Anthony, the skeptic’ could coexist. I could be Muslim and have questions about faith.” What role does Islam play in the identities of these American Muslim men? In what ways is Islam a source of comfort and also a source of friction? How do individual writers find a way for their religion and their larger identities to coexist together? The contributors to Salaam, Love reflect on how their religious traditions have influenced their attitudes toward love, marriage, and intimacy. If you were raised in a different religious tradition, how has that tradition affected your relationships? How is this similar and different to the experiences of the Muslim men who contributed to this collection?